A locally administered parochial poorhouse or almshouse was operated by the parish of Dunnet from at least the early 1870s. The building was located at the north of West Dunnet and is identified on both the first edition Ordnance Survey map of 1873, and the second edition of 1907. The Thurso Combination was formed in about 1853 and comprised the 8 parishes of Bower, Canisbay, Dunnet, Halkirk, Olrick [Olrig], Reay, Thurso and Watten. In 1881, the member parishes had a combined population of 20,362. In 1924, the poorhouse site was sold off by the Combination after having stood empty for several years. The former poorhouse has been converted to housing but in 2001 was again standing empty. 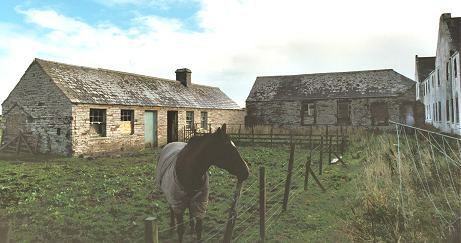 Thurso from the south-east, 2001. Thurso from the west, 2001. In around 1900, the parish of Halkirk began renting a small property for use as some kind of parish almshouse or lodging house. In 1904, it was recorded as accommodating up to rwo men and two women. Caithness Archive Centre, Wick Library, Sinclair Terrace, Wick KW1 5AB, Scotland. Holdings include: Combination Poorhouse minutes (1905-1925); Record of applications for relief (1855-1917); Children's register (1854-1900); Inspector's visiting book (1873-1889).